This is cause for celebration for all kinds of people: hockey players, ice fisherman, and basically any kid with a pair of skates. If you don’t fall into one of those categories, I am hereby inviting you to have a winter adventure: beg, borrow or steal yourself a pair of skates and go check out your local pond. There is definitely something thrilling about getting right out onto the middle of that pond you usually admire from the shore – it’s just a little more fun, a little more adventurous than skating at a rink. Mother Nature is not always forthcoming with this particular winter gift, so when it’s given, we have to take advantage: head out to your nearest frozen pond now, for some gliding, giggling and sliding across the glittery, sparkling ice- while you can. 1. It’s lovely. Wallace Pond is tucked into a beautiful corner of the park. 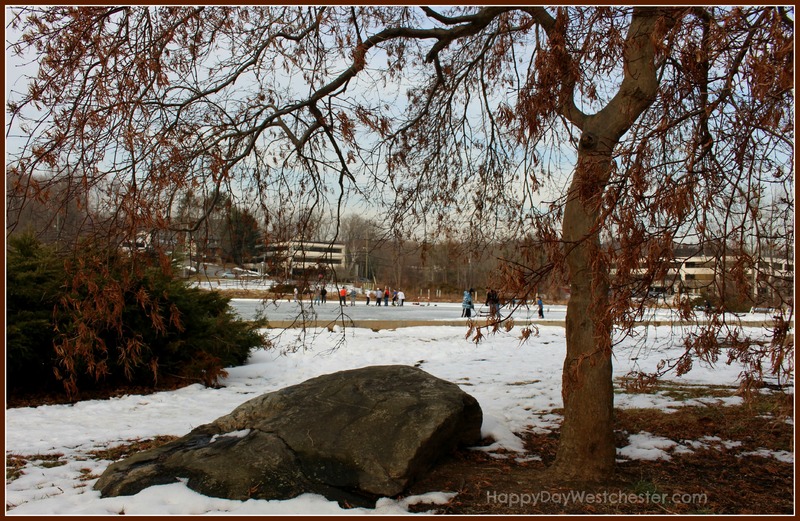 On the short walk from the parking area to the pond, we noticed beautifully manicured trees, a waterfall, a wooden bridge, a rocky stream, and a sledding hill in the distance. Perfectly picturesque. 2. The Tea House. 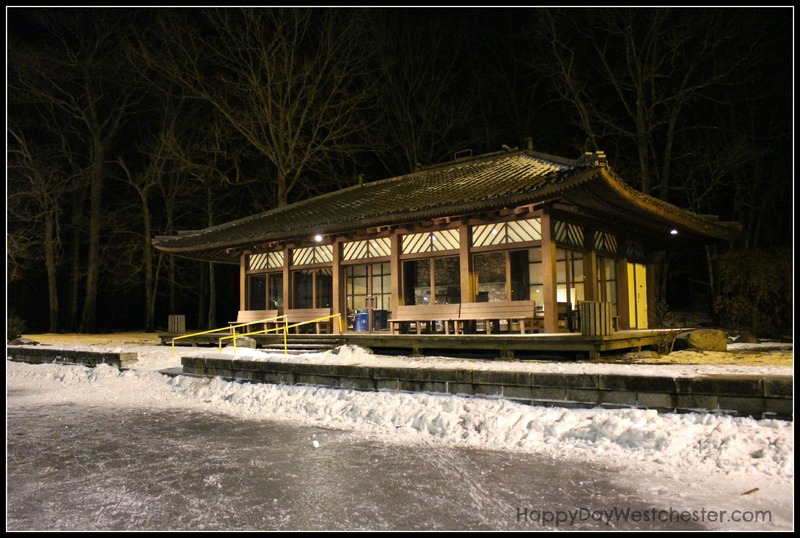 The Tea House on the shore of the pond is something I’ve admired from afar for years, but never had a reason to visit. Skating was the perfect reason to check out the Tea House up close. 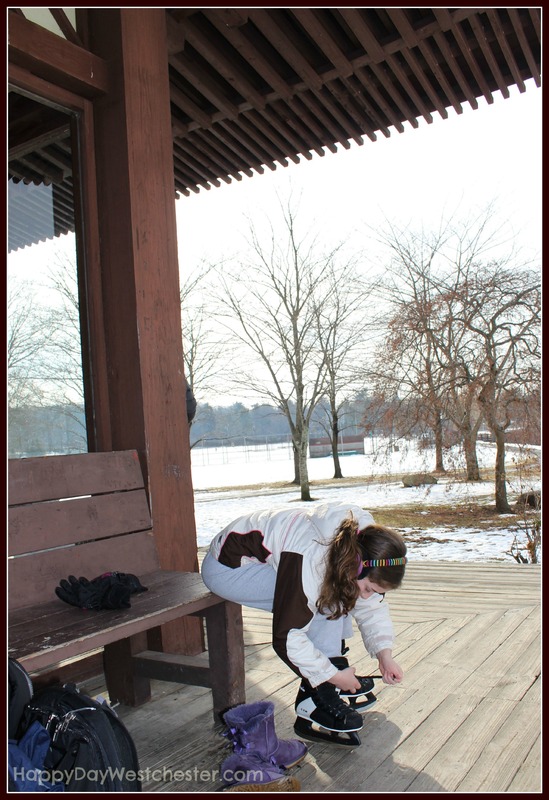 We used the benches along the porch of the building to put on our skates… and we left our shoes and bags here too. For anyone sitting this one out, these benches are the perfect place to get comfortable and watch the show. 3. 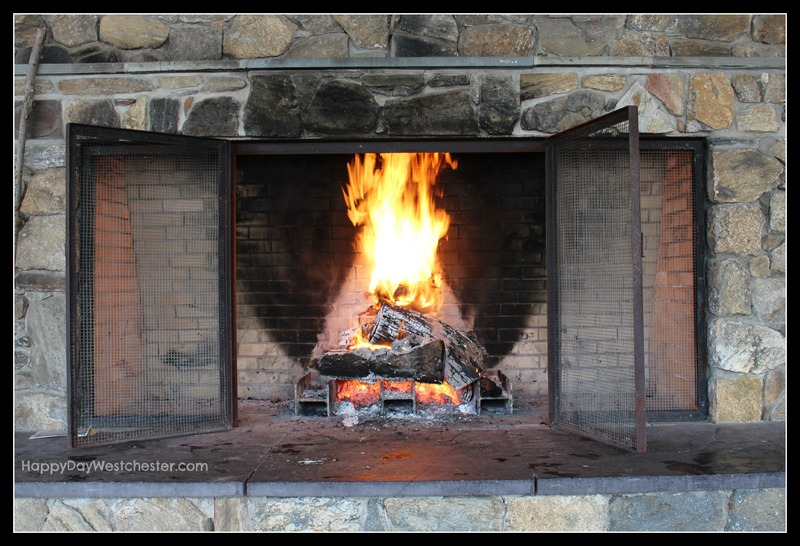 The Roaring Fire. This was the biggest surprise of the day. Inside the Tea House was a roaring fire, perfect to warm up our cold fingers and toes after a little while on the ice. 4. It’s bustling. 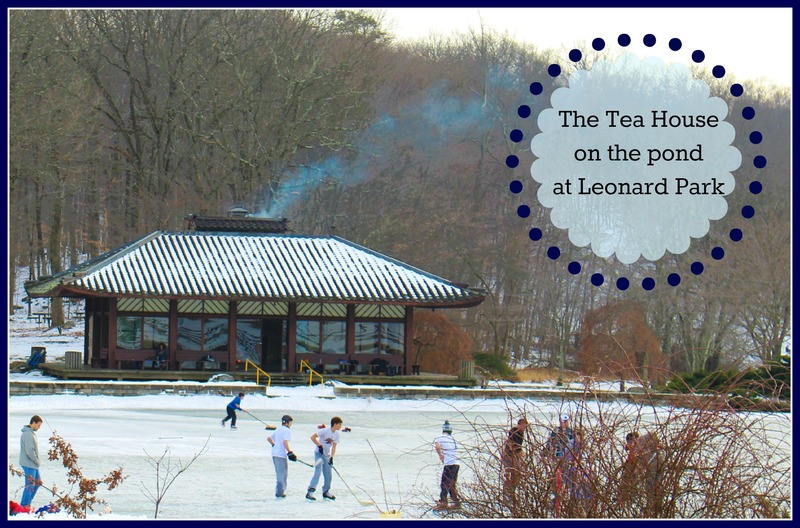 Wallace Pond was bustling with people – teenagers playing hockey, little boys throwing snowballs, neighbors chatting on the benches, and dog walkers. In the middle of a cold winter, it was great to see so many people outside, in one place, enjoying themselves. Blue Mountain Reservation in Peekskill. 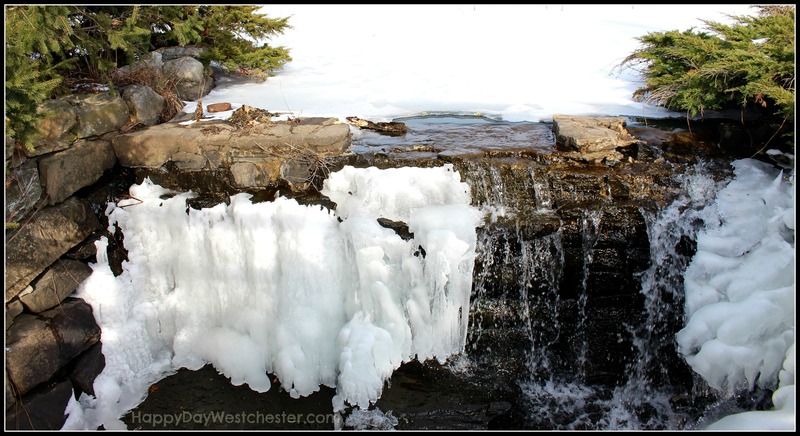 Visit the Westchester County Parks website for updates. Wherever you choose to go, do it soon: you never know when this cold snap may end, melting our frozen ponds. Get out for a winter adventure while you can! 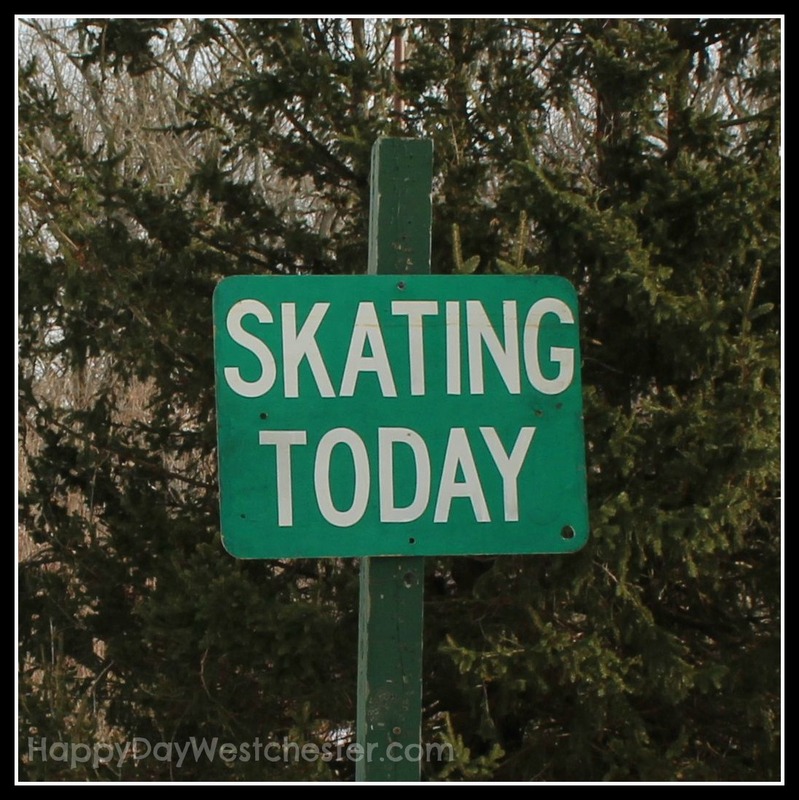 Great article…..I live a few blocks away and didn’t know you could skate on that pond. I would love to go! Stop by while you can! I love this post. Ice skating outside was a favorite pastime where I grew up in Iowa! Then you will fit right in on the pond, maybe teach is some of your tricks! Falling is part of the fun! Really. It’s true. if you have little ones, put them on a sled and push it across the ice — so much fun! !